My skin has not been in the best shape the past few weeks. I've been super dry and had some weird allergic reactions to a few things (I think a Charlotte Tilbury eye cream was to blame) so I've been really trying to get everything back to normal. About a month ago I noticed that I felt super dry, everywhere. My mouth, nose, hands, cuticles, face, and body were just completely parched. I drink my weight in water each other (it's the only thing I drink) so something had to be done. I've been in a huge beauty funk; I wasn't really taking care of my skin and I wasn't feeling any of my makeup and I was just over it. 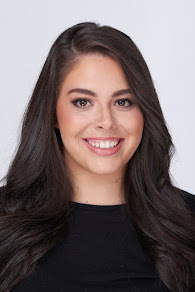 Within the past 2-3 weeks, I've hit a reset button and makeup/beauty is all I want to do. It worked out well because I've kind of amped up my skincare routine, or at least started using some products a little more strategically. 1. 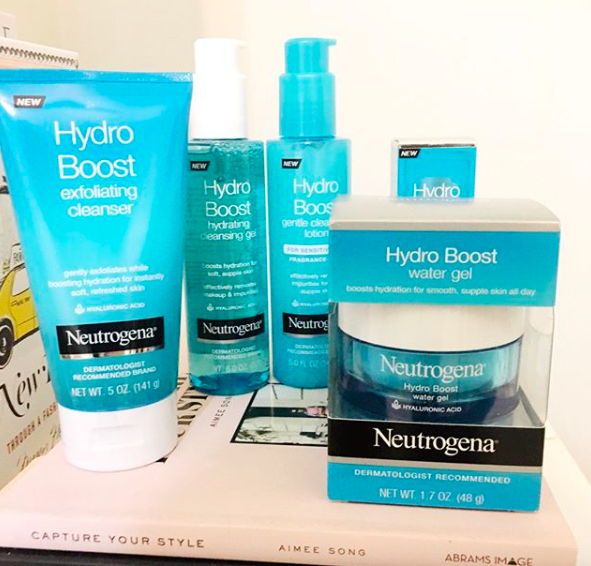 Neutrogena Skincare: About a month ago I did a sponsored post on Instagram with Neutrogena. They sent me their Hydroboost line and holy hell, I've been obsessed. I've been out of the drugstore game for a while but this pulled me in. My three favorite products have been the Cleansing Lotion, Exfoliating Cleanser, and Multi-Vitamin Booster. I love a good cleansing oil but this cleansing lotion is not as emollient as a cleansing oil and has a much better consistency in my opinion. It's gentle but removes all my makeup like a dream. The Exfoliating Cleanser is also super gentle but it doesn't dry out my skin like some exfoliators can; it has tiny beads that aren't too rough and also has a great gel-like consistency. It deep cleans my skin and leaves it feeling fresh and hydrated. Finally, the multi-vitamin booster serum has been great to lather on at night when my skin needs an extra boost. I haven't noticed a huge difference when I use it but I like to incorporate some kind of serum into the routine and this has been a great addition. 2. Tatcha Violet C Radiance Mask: I don't think this can really count since I used it once, and it was a foil packet sample but holy crap, I'm buying the full size. My skin was feeling very discolored, uneven, and blotchy last weekend and I was fed up with it. I knew this mask had amazing reviews and I knew I had a sample of it. I slathered the violet mask on, left it on for 15 minutes and was stunned at the results. My skin looked totally different; a lot of the spots were gone and my skin looked brighter. The results have lasted almost a week later. I am stunned at the magic that is in this mask and I need more of it. I have never seen a skincare item act so fast and so well. 3. Summer Fridays Jet Lag Mask: If you have seen my Instagram post, you know I've fallen in love with the latest social media beauty craze. 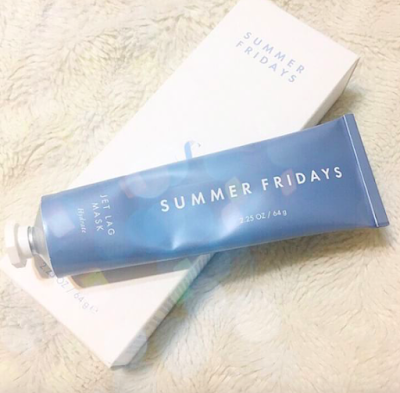 Star influencer Mariann Hewitt launched her brand Summer Fridays a few weeks ago and the first product is this Jet Lag Mask. It's very aesthetically pleasing in terms of packaging and is perfect in the formula. It's made to be a mask that will hydrate your parched and ragged skin, two things that happen to your skin when you're constantly flying and feeling jet lagged (get the name?). A special thing about this mask is that it is a white cream but doesn't look like a regular face mask when applied on your skin. It's basically clear or looks like a regular moisturizer. Since receiving it a few weeks ago from Sephora, I haven't used it as a mask. I use this nightly as a night cream, after my Sunday Riley Luna Sleeping Night Oil or the Neutrogena Serum. I wake up and my skin looks healthier, plumper, and just better all around. I never, ever want to be without this mask. 4. Drunk Elephant Baby Facial: I might've mentioned this once before, either in a video or in an old blog post but I've been thoroughly enjoying this mask lately. It's like a reset button for my face and I put it on whenever I feel like I need to even my face out, or when I just need to get rid of dead skin cells. There is a reason it's so popular and it's because it really works. 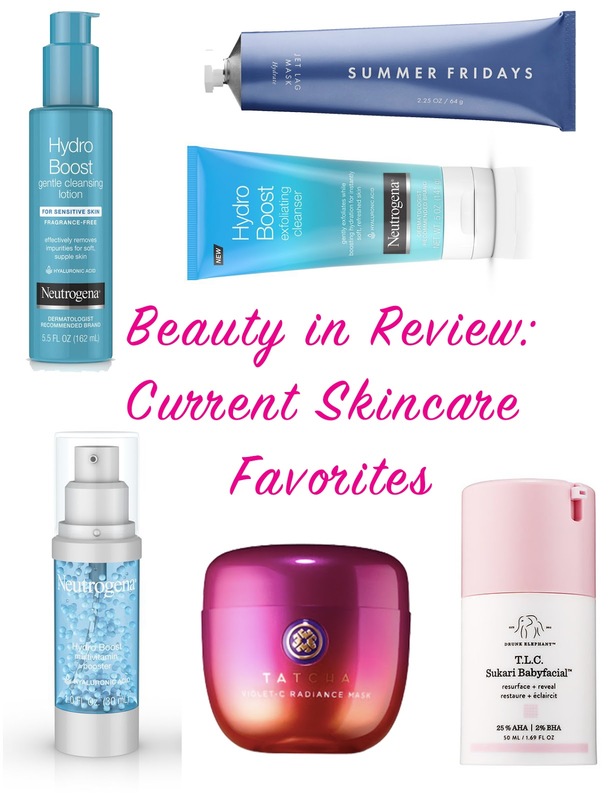 Similar to the Tatcha mask, I see immediate results, like I actually went and got a facial, after I use it. It's expensive AF but if you could get the mini size like I did, I recommend it!